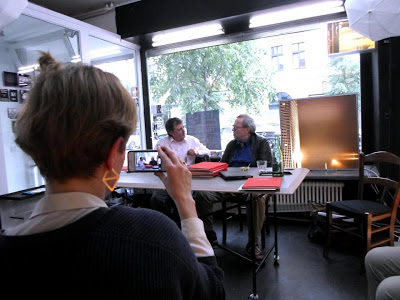 Last Friday, May 10, 2013, we celebrated the publication of Valeska Gert. Bewegte Fragmente. Eine Quellenedition / Fragments in Motion. A Source Book (published by Hybriden Verlag) in Gallery Maifoto in Kreuzberg. For the occasion my co-editor Wolfgang Müller talked with media artist Ernst Mitzka about Valeska Gert. I videotaped the conversation with my i-phone. It seems my camera was focusing on the luring red cover of the book instead of on the faces behind it! At least the sound is ok. Yet it is only for German speakers ... The great news is that the book is in both German and English. The translation was done by Ana Isabel Keilson, who is a cultural historian from Columbia University, New York, working on dance. Ernst Mitzka's wonderful videos of Valeska Gert performing Baby and Death in 1969 do not only accompany the book as a DVD, together with beautiful film stills there are also on show until May 17 in Gallery Maifoto, Dresdenerstr. 18 in Kreuzberg, Berlin. Check it out!